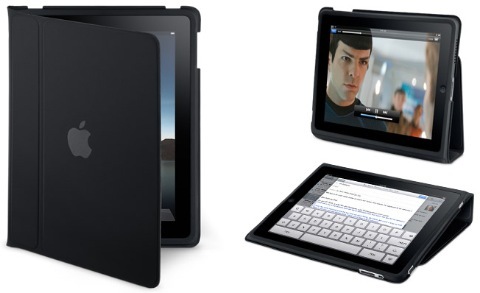 iLounge provides some details regarding Apple’s iPad accessories. Apple will be offering a new VGA to Dock Connector Adapter which will cost $29 and allow you to connect your iPad to a projector or monitor and a Camera Accessory Kit which will also cost $29 that will come with a USB and an SD card reader adapter in one package. Apple will also offer an iPad case for $39 that still gives you access to all the iPad’s ports. It can also flip around and act as a stand for the device. In terms of docks, Apple will offer a standard dock for $29 with audio and dock connector ports on the back. They will also offer a keyboard dock which offers the same ports as the standard dock but also includes a built in keyboard. It will cost $69, but it includes some very interesting keys (view this image at full size). There are several new keys in the function row such as search, lock, a blank one, one with a keyboard on it, and a couple others that I can’t decipher. Also interesting is the inclusion of control, option, and command keys on the keyboard. One would assume that these are for typing special characters but I wonder if Apple is planning to use those for new functionality, maybe even application switching. 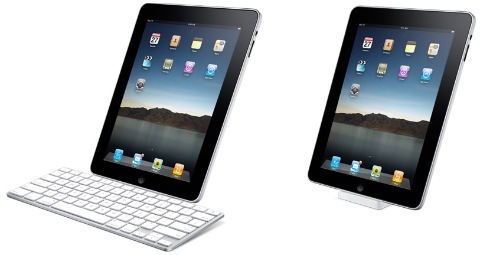 Another interesting bit pointed out by iLounge is that the iPad will be compatible with Bluetooth keyboards. I’m really happy to hear this, I wasn’t too jazzed about the idea of having to spend another $69 if I wanted to use a real keyboard with the device.